The animals were used as the primary means of achieving military mobility during the First World War. Mechanisation was in its infancy; so there were few trucks or lorries available and they were mechanically unreliable and road-bound. Every branch of service – infantry, artillery, cavalry, engineers, logistics - was dependent on equids. They were employed either as riding animals (primarily, but not exclusively, in the cavalry) or, in greater numbers, as draught animals, so they fulfilled both a combatant role in battle, and in supporting logistics. “We always think of modern wars as being ‘mechanised’ but in fact the scale of animal use during both world wars was unprecedented. Never before have so many animals been mobilised for military service – unless we recognise this, we fail to understand how modern wars were actually fought,” Gervase Phillips, Principal Lecturer in History at Manchester Metropolitan University, told FEI.org. Phillips said the greatest single demand was probably for gun-teams to haul artillery pieces. North American mules and North American light draught horses proved especially useful to the British in this role and tens of thousands were brought across the Atlantic. Throughout the conflict, the British Army deployed more than a million horses and mules, though there weren’t enough horses in Britain to meet demand, so over 1,000 horses a week were shipped from North America. A French veterinary report claims that 30 per cent of animals used by the French army were imported (mainly horses, perhaps some mules), a total of about 525,000, with "a few tens of thousands" from Argentina and the rest from the US - perhaps 485,000, lacking any more accurate data. It would be roughly accurate to say that about 1,325,000 American horses and mules were used in the war. 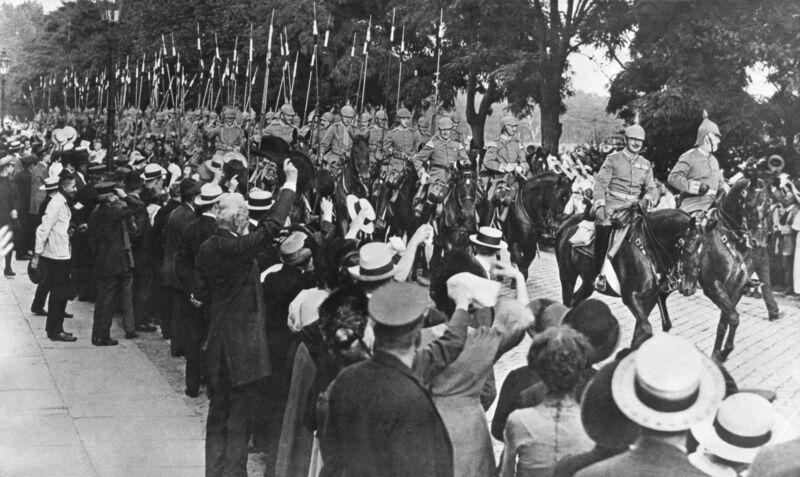 Gervase highlighted the major impact of having access to, or lack thereof, horses and mules led to the war’s end, with Germany drastically short of horses by 1918. He said: “They dismounted their cavalry not because it was necessarily useless (in Eastern Europe it was clearly very useful) but because the artillery needed the horses more. When the German spring offensives of 1918 ruptured the Allied front lines in France and Belgium, they were unable to exploit their breakthroughs because they had no mobile forces, ie cavalry. Gervase points to the poor conditions and tough works that horses and mules endured throughout World War I. “War is always tough on horse and mules,” he said. “Overwork, exposure to the elements, lack of grooming, poor rations were the reality of life for many military horses. In some instances, conditions had improved; the British for example provided far better veterinary care to their horse during WW1 than they had during the South African War (1899-1902). Individual horses have been remembered, such as the famous war horse Warrior, dubbed "the horse the Germans could not kill" being presented with the Honorary PDSA Dickin Medal posthumously. Kasztanka was another famous horse that belonged to Polish war hero Marshal Jozef Pilsudski. Her name means chestnut in Polish, a fact that attributes to her colour. She had been owned by Ludwik Popiel, and came under the ownership of Pilsudski in 1914. She carried her master in many battles of Polish Legions at the side of Austro-Hungary and Germany during the First World War. Meanwhile, only one horse out of more than 136,000 “walers” (the general name applied to Australian horses abroad) made it back to Australia - Sandy, who belonged to Major General Sir William Bridges. Gervase says that while in the past the role played by horses in the First World War has not been recognised, today we are much more aware of their impact. He adds that this is in part may be due to popular culture, with Michael Morpurgo’s War Horse being a clear example. Official commemorations have also played a part in bringing the horses and mules of the wars into public consciousness, such as the Animals in War Memorial in Hyde Park, London. This memorial has two inscriptions: "This monument is dedicated to all the animals that served and died alongside British and Allied forces in wars and campaigns throughout time." The second, smaller inscription simply reads: "They had no choice."